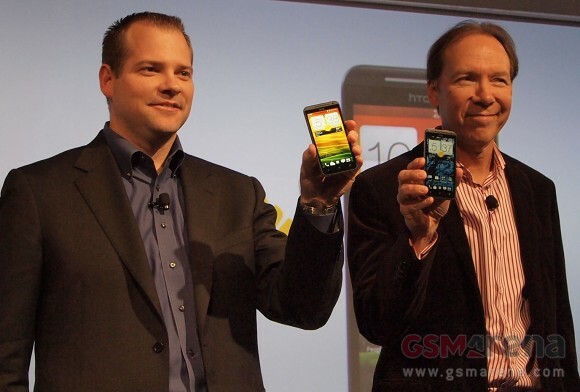 Sprint Wireless's CEO Dan Hesse and the HTC president Jason Mackenzie officially took the wraps off the carrier's Android flagship - the HTC EVO 4G LTE. The smartphone is the successor of the HTC EVO 4G, which saw the light back in 2010, and has the kickstand to prove it. In terms of the specs, the newcomer is closely related to the upcoming HTC One X for AT&T. It sports the same Snapdragon S4 chipset with two CPU cores, clocked at 1.5GHz. There is a gig of RAM on board and 16GB of built-in memory, which can be further expanded via a microSD card slot. The screen is the already familiar, gorgeous 4.7" super LCD2 unit with HD resolution. An 8MP camera is located on the back, while a 1.3MP sits at the front of the device. Both can record HD videos in 1080p and 720p respectively. A 2000mAh battery powers the handset. On the software side of things, the HTC EVO 4G LTE packs Android 4.0 Ice Cream Sandwich, dressed in HTC's latest Sense 4.0 UI. Beats Audio is on board as well. The smartphone is also the first to feature HD voice capability on Sprint Wireless's network. Like most things HTC, the EVO 4G LTE is superbly put together. Most of the device's body is made from a single piece of aluminum. The dedicated camera button of the device is also made from the lightweight metal. We were present at the HTC EVO 4G LTE's unveiling in New York City. Naturally, we had our camera handy, so here go a couple of live shots of the device. The top shelf smartphone will be available for pre-order on May 7 for $199.99 with a two-year commitment. Expect to see it on the shelves at some point during Q2. please can i use this HTC EVO 4G in ghana ? LMFAO!!!!!! Funny troll is funny. This looks to be the perfect update to the EVO, considering Sprint hasn't had jack-squat since the EVO came out.